Asuka (飛鳥) was the Imperial capital of Japan during the Asuka period (538 – 710 AD), which takes its name from this place. It is located in the present-day village of Asuka, Nara Prefecture. Some of the many theories of what the place was named after include the bird common crossbill, or isuka in Japanese, or local geological features, e.g. 洲処 (suka, meaning sandbar, sandbank or delta) or 崩地 (asu) + 処 (ka)[clarification needed]. Or it may have been named in honor of Asuka (or Ashuku) Nyorai, the Japanese equivalent of Akshobhya, one of the Five Buddhas of Wisdom, who is still worshiped in Asuka-dera (Asuka Temple), the Asuka-niimasu-jinja (the shrine for his manifestation as a Shinto god), and several other structures from those days. Archaeology projects continue to uncover relics from these ruins. Recent discoveries in the area include Wado coins, believed to be some of the oldest coins in Japan, and paintings in the Kitora and Takamatsuzuka Kofun, or tombs. 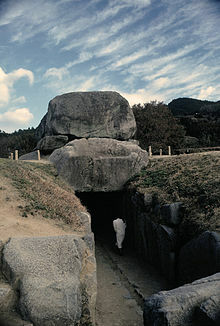 The Ishibutai Kofun is also located in Asuka. On March 12, 2004, the discovery of the remains of a residence's main building adjacent to the kofun was announced. It is likely that the residence belonged to Soga no Umako, who is believed to have been entombed in the kofun. Asuka can be reached from either Okadera Station or Asuka Station on the Kintetsu train line, or by car on Route 169. In the Asuka period, various palaces were constructed for each monarch. As soon as one emperor died, the whole court moved to a newly constructed palace, since it was considered dangerous to remain in a place where a deceased monarch's spirit might reside. Sometimes even during a single emperor's reign, palaces were changed multiple times due to destruction by fire or ill omens. Since these palaces were entirely constructed from wood, none of them have survived, although some archaeological work in modern times has uncovered such remains as stone bases for pillars. Asuka was abandoned by Empress Jitō when she and her court moved to Fujiwara-kyō. Ponsonby-Fane, Richard (1915). The Imperial Family of Japan. Kobe. OCLC 9113902. ^ Ikeda Suenori 池田末則, Yokota Kenichi 横田健一 et al. "飛鳥 (Asuka)" Nara-ken no chimei 奈良県の地名 Heibonsha 平凡社, 1981, p. 263. ^ Nussbaum, Louis-Frédéric. (2005). "Asuka," Japan Encyclopedia at p. 59. ^ Koch, W. (1904). Japan; Geschichte nach japanischen Quellen und ethnographische Skizzen. Mit einem Stammbaum des Kaisers von Japan, p. 13. ^ a b c d e f g h Asuka Historical Museum, Palaces of the Asuka Period," 1995; retrieved 2011-11-25. ^ a b Ponsonby-Fane, p. 20. ^ a b Ponsonby-Fane, p. 21. This page was last edited on 16 April 2019, at 03:54 (UTC).